The last 3 days have created an interesting setup. Thursday SPY made a new 50-day closing high. Friday SPY posted an inside day. And then Monday was another 50-day closing high. This has only happened 16 other times since 1999. Below is a list of all the instances along with their performance the next day. Risk/reward here heavily favors the short side. The average drawdown is nearly 4 times the size the average run-up. Also notable is that every instance saw drawdown of at least 0.35% the next day, but only 1 of the 16 instances saw run-up of at least 0.35%. Futures are up 2.5 points right now about an hour before the open, but there may be some headwinds based on this pattern. Thursday marked the 2nd day in a row that SPY posted an unfilled gap up. It also closed at a 50-day high. The unfilled up-gaps are considered a sign of strength. Unfilled up gaps can sometimes be seen as a sign of strength. The study below examines whether this may be the case when the market is at an intermediate-term high. The size of the follow-through isn't terribly large, but it has been very, very consistent that some follow through was achieved. This suggests a good chance at more upside in the next few days. I will note that not every study I am seeing is bullish right now. There is a bit of a mix. When the market begins to get overbought it will often suggest a pullback is likely. When overbought gets powered through then odds will sometimes shift from a pullback to a continuation of that move. The last two nights I have seen some studies suggesting this scenario. The study below is on that I have showed a few times in the past. All stats are updated. These results appear to suggest a pretty consistent upside edge over the next 1-3 weeks. 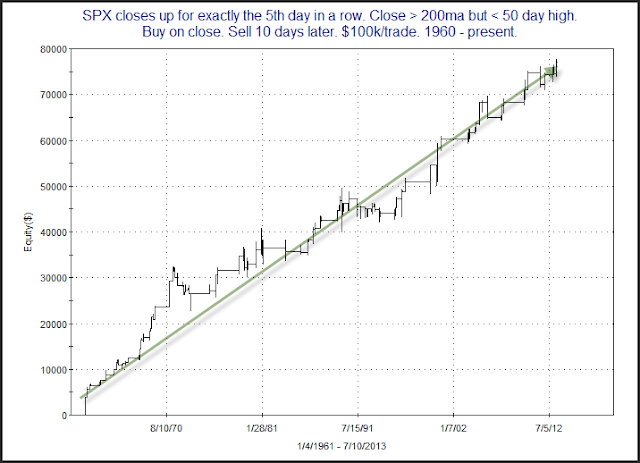 In fact, below is a profit curve showing just how consistent it has been over the years using a 10-day exit. That's an impressive upslope for a period covering over 50 years. 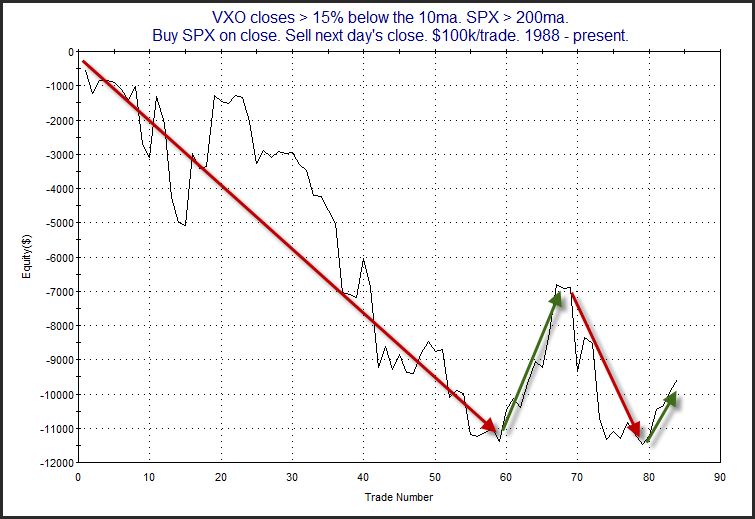 One index providing interesting readings is VXO (the old VIX calculation). On Monday it closed a little more than 15% below its 10ma. And it may do that again today. At one time, such rapid drops in the VXO were often followed by a move lower in the SPX. But this has not been as consistent in recent years. Below is a study I showed in last night’s Subscriber Letter. Stats here seem to suggest a bit of a downside inclination. But the equity curve tells a little bit of a different story. The downside edge seemed apparent for the 1st 60 instances or so. But the last 25, all of which occurred over the last 3 years since June 2010, have been extremely choppy and shown no progress. For whatever reason the market seems to have changed, and traders should be aware of that. I’ve updated the Quantifiable Edges Big Time Swing System overview page with results through June 30. There have been no trades since then. 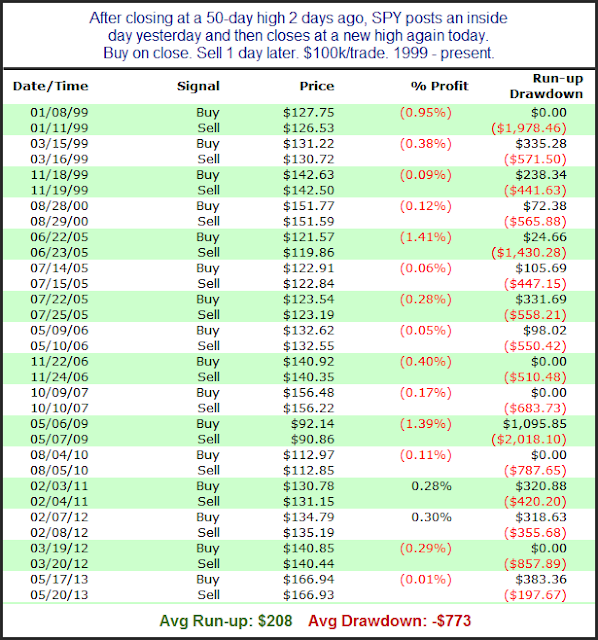 The system only averages about 1 trade per month, so I typically update the results bi-annually. The QE Big Time Swing System has been on a roll in 2013. It has had 6 trades, one of which was a carry-over from near the end of 2012. 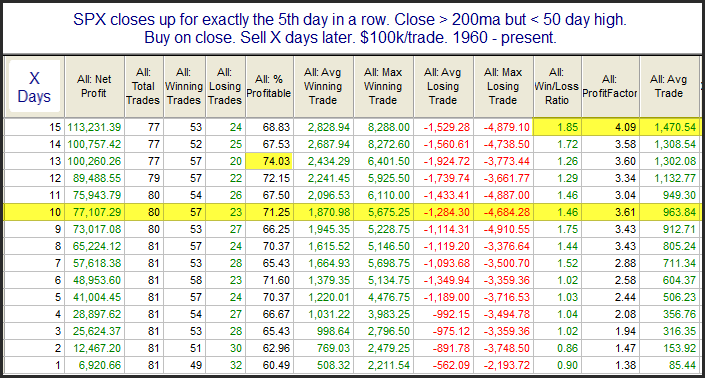 Five of these trades have been to the long side, and one short. All of them posted gains. The signals produced a net return of 10.84% for SPY (including dividends, commissions of $0.01/share, and an assumed interest rate on cash of 0.1%). The system also continues to make new equity highs. The Big Time Swing System provides easy to follow mechanical rules. The standard parameters are not optimized and have performed quite well (they are the ones used for all performance metrics). There are only about 11 trades per year averaging 7 trading days per trade. All entries and exits are either at the open or the close. And to be sure you have everything set up properly traders may follow the private purchasers-only blog that tracks all SPY signals and possible entry/exit levels. This service is free for 12 months from the date of purchase. For system developers looking for a system that they can use as a base to build their own system from, the Big Time Swing is an attractive option. It is all open-coded and comes complete with a substantial amount of background historical research. And since it is only in the market about ¼ of the time, it can easily be combined with other systems to provide greater efficiency of capital. Once you’re ready to try and improve the system yourself you can also refer to the system manual or the August 2010 purchaser-only webinar – both of which discuss numerous ideas for customization. 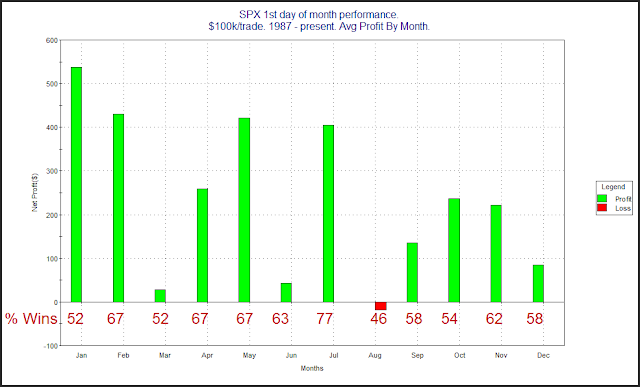 Since the late 80s there has been a strong tendency for the market to rally on the first day of the month. One theory on why this occurs is that there are often 401k inflows that are put to work on the 1st of the month. A few years ago I examined this tendency and broke it down by month. I thought it would be interesting to take another look at it today. Below is an updated version of the study shown here on July 1, 2009. July has been the most reliable month in term of closing positive, but when looking at the size of the average gain, it comes in 4th. You also note that August is the worst on both counts.